This is the third installment in a series on the American Legion Field-Allen Post 148 on the occasion of the Post’s 80th Anniversary. Previous articles provided background on the Post’s namesakes and the second in the series looked at the early years of the Post and the Charter members. Despite many accolades and years of service to veterans and the community, the aging Post membership of mostly WWII veterans was in serious decline and in 1999 the American Legion, Department of Maine intervened and held a general meeting of local veterans to provide an infusion of membership into the Post. Because of the meeting, Col. Don McCormack, Maine Air National Guard, was elected Post Commander along with a new Executive Committee. Under Commander McCormack’s leadership the Post was reorganized and revitalized with goals set for finances and membership. Within a year the Post membership was up to 68 and growing. Commander McCormack established social events and veteran’s support activities and Memorial Day activities, which all became significant events in the Town of Windham. Under Commander McCormack’s leadership the Memorial Day Parade was reestablished along with an Air National Guard flyover. A Memorial Day Ceremony was established in front of the new High School after the Veteran’s Monuments were relocated to that location. Additionally, an open house, sponsored by the Legion Post, was set up at the WVC for all to attend. The Legion Post worked closely with the VFW Post to ensure that flags were placed on all the graves on veterans in the 30 cemeteries in the Town. 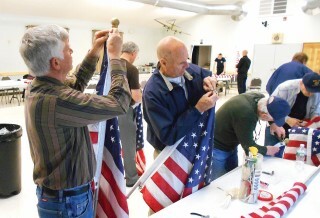 Commander McCormack’s parting challenge in 2006 to the community and the Post was to have the Town show its patriotism with the annual placement 100 American Flags on the utility poles lining the major thoroughfares of Windham. After almost five years at the helm, Commander McCormack relinquished the helm to Commander Dave Tanguay, who continued to set new membership goals and expand veteran support. During the ensuing four-year period, the grounds around the WVC were revitalized with a Veteran’s Memorial Garden, with walk ways, granite benches, flower gardens and trees. Membership reached 80 plus, and the Post established an award winning monthly newsletter sent to all the membership. Post visibility was increased in the local newspapers and events such as an annual pig roast were established. Memorial Day Programs continued to grow and prosper. In 2010, Commander Barry Lombard assumed the leadership of the Post. More social events were added to the annual schedule including a St Patrick’s Day Scholarship Dinner and bean suppers. The Boys and Girls State Programs were revitalized, culminating in five students being sent to their respective conventions in 2012. Memorial Day weekend events became busier with the addition of a well-orchestrated food drive to benefit the Windham Food Pantry on the Saturday before Memorial Day. All these events were added to the already full schedule of parade, flags on cemeteries, ceremonies, and open house. As of 2013 the Post membership broke the 100 mark with a 111 percent gain over the previous year. Commander Lombard has established a “social hour” and dinner preceding the business meetings where the membership can gather over refreshments and socialize before the now well-attended meetings. Under Commander Lombard’s leadership, there has been a renewed emphasis on veteran’s related events. Barry worked closely with the local VFW Post Commander to conduct joint activities which included: cribbage matches, silent auction, free spaghetti dinners, and a Welcome Home Vietnam Veteran’s event. The Post was saddened when Commander Barry Lombard passed to Post Everlasting in August of 2013. He was laid to rest in Arlington Cemetery, North Windham, Maine. Chaplain Dana Reed of the Post officiated and a joint VFW and American Legion Rifle Squad render military honors. In November of 2013 the Post installed a new Commander, Melvin Greenier. Although new to the Post, Commander Greenier has made his mark with the development of a Post web page and the expansion of the Post Family to include the Unit 148, Post Auxiliary and the addition of Junior Legion Baseball. The Field-Allen Post was also instrumental in providing the logistic support for Studio Flora’s Everlasting Gratitude Wreath Program, which provided wreaths for all the veterans’ graves in all the cemeteries in Windham. The program continues each December. The Field-Allen Post has garnished recognitions both at the state and national level. As of Dept. of Maine Convention 2017, The Field Annual Post received the following: Post Excellence Award (fourth consecutive); Americanism Award, (second consecutive), First Place Post History (second consecutive); First Place, Newsletter (fifth consecutive); High Membership (eight consecutive), Most New Members in a Year (2016-17); and five individual recruitment awards. The Post’s nomination as Educator of the Year has been selected as the Department of Maine Educator of the year for three of the last four years. The Post Service Officer, Henry Chuck Whynot, holds weekly Wednesday morning Vet Coffee Socials as a drop-in program for local vets providing an opportunity to get out of the house, play cards, and generally socialize with other vets. The program over the last 24 months has been instrumental in many of the new memberships previously noted. The Post Service Officer also initiated a weekly Food Drop-Off Program in Windham to support the Portland Vet Center Food Pantry for homeless veterans. Over the last six months thousands of units of food have been distributed to vets in need. In 2017, under the leadership of Post Sgt. at Arms, Larry DeHof, the Post formalized the formation of an Honor Guard and Rifle Squad unit of 10 members to support local request for such services. All the HG members are in Official Legion White Shirts, as standard uniform along with the Official Hats. As of July 2017, the HG and Rifle Squad participated in seven events. Looking ahead, the Field-Allen Post is actively engaged in recruiting new, younger members. After 80 years of service, the Post is proud of its history and is looking ahead to additional decades of supporting veterans and the community with leadership, role models, youth programs, and service. The Field-Allen Post meets the first Wednesday of the month at the Windham Veterans Center, 35 Veterans Memorial Drive, North Windham, Maine. There is a 5 p.m. social dinner followed by a 6 p.m. business meeting. For additional information contact Commander Mel at 892-7449.